Bonnie, an 8th grade student, was nominated for this award by the 8th grade team based on her strong work ethic, intrinsic motivation, and respectful nature. Bonnie is respected and well-liked by teachers and peers alike. She is a member of the PCMS band and the Jr. Beta Club. 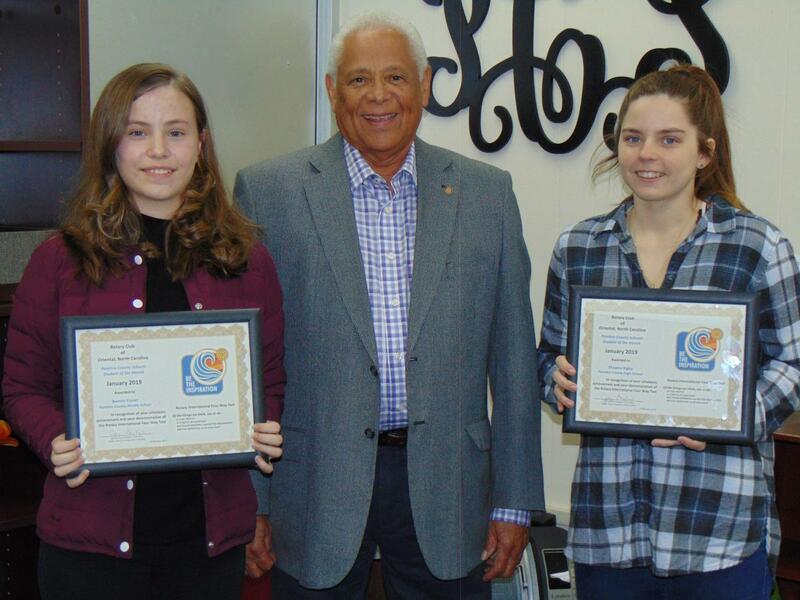 Bonnie is a positive asset to the Pamlico County School System and it is her teachers’ pleasure to nominate her for Rotary Student of the Month. Shawna is very active in the school as a member of the track team, NJROTC, student government, and the National Technical Honor Society. Even when she misses class due to these activities, she makes every effort to make up all missing work and maintain a good grade in my class. Despite being concerned that she would have trouble with drafting, she continued to try hard and is one of the top students in her class. Shawna was nominated by her drafting teacher, Paul Odom. Picture: (left to right) Bonnie Frazer, Dan Giro, Rotary Representative, and Shawna Rigby.